Xin nian kuai le. Wan shi ru yi. Happy New Year, everyone! It’s the year of the Rabbit. Rabbits are lucky little guys, so I wish you all a very lucky, happy, healthy, and fruitful year ahead. 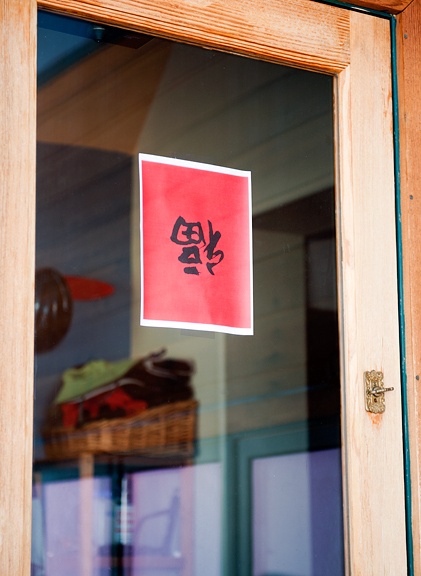 The house has been busy here at urb-central as it always is before Chinese New Year. We have spent the past few days preparing food, cleaning the house, following the news, and hunkering down during the wicked cold spell that had a hold on much of the country recently. A couple of weeks ago, my friend Kitt had posted a cool video of a young woman throwing boiling water into the -40°F air. Can you guess what happened? As Jeremy watched the outside temperature plummet the other night to -25°F, we wondered if we could get that same phenomenon to work. So we went outside on the deck to give it a try. 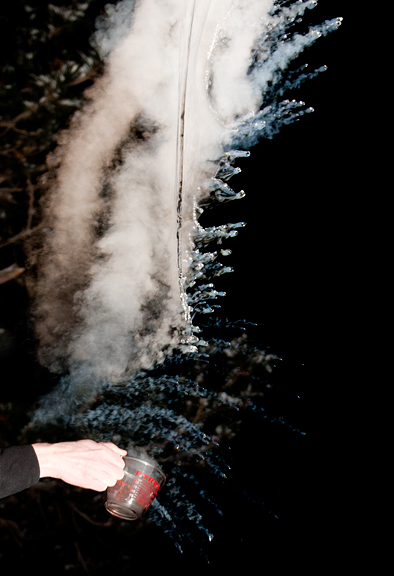 The water evaporates in the air before hitting the ground. 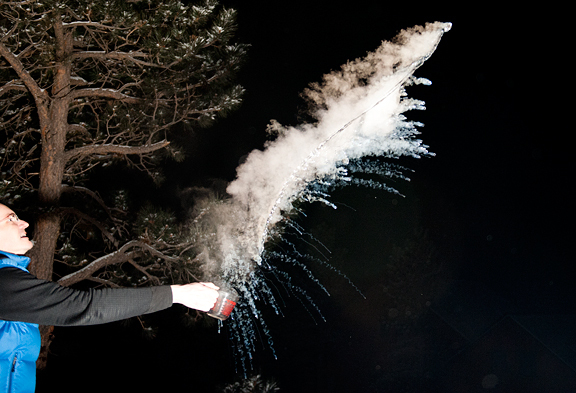 I’m pretty sure our neighbors thought we were on crack tossing water off the deck and firing the flash several times in the night. [I guarantee you we are the most sober residents in this town.] The next morning, it was still -23°F. So before Jeremy left for work, he humored me and we tried another boiling water toss off the deck. And because it was daytime, I was able to shoot a nice sequence of it. You can see more of the nighttime shots and larger daytime shots on the photoblog. That was pretty COLD. Kaweah kept wanting to come out onto the deck with us because she equates baking her brains in the sun with walking onto the deck. 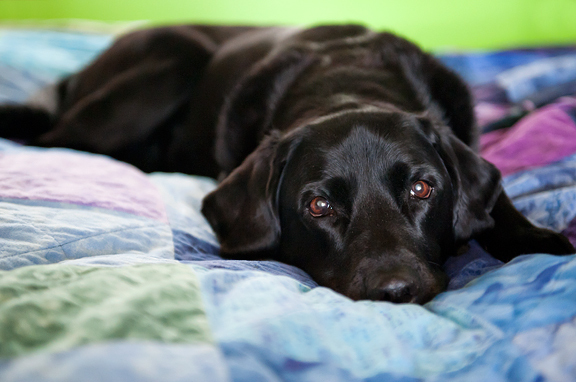 But we’ve been keeping her inside the warm house since her old body gets very stiff when it’s cold. A few times Jeremy has had to go and rescue her at night when she was let out to potty because she got stuck in the snow when her paws got so cold she couldn’t walk. She’s more susceptible to temperature extremes as she has aged, but she’s not any smarter. Right now, our house is clean and our refrigerator is full of lucky foods. Per tradition, we always clean the house on Chinese New Year’s Eve because you can’t clean the house for the first two weeks of the new year or else you will sweep out the good luck. This put me in a bit of a panic because I’m hosting something during that time period at my house. I also made a small feast for our New Year’s Eve dinner – each dish or component represents some form of health, luck, fortune, and happiness. And then there is dessert. I almost always make western desserts when we entertain because most people I know aren’t that thrilled with Asian or Chinese desserts. When I was a kid, the typical dessert in my house was fruit. On special occasions, my dad would make almond jello or sesame bananas, reading the recipe from a fat book packed with delicate, thin pages covered in Chinese characters. Kris and I would get so excited. At the real Chinese restaurants (the ones where the waiters can barely speak English), they would serve a warm sweet soup of some kind for dessert. Sometimes it was sweet red bean soup, sweet green bean soup, tapioca coconut soup, black sesame soup, or sweet peanut soup… Soup. And there was taro root soup. In the early days of our relationship, Jeremy would eye the soup and politely take a few sips. If we were in the company of my grandmother, he would finish his bowl (my grandma – she LOVES Jeremy). It’s grown on him, but he doesn’t indulge when I make sweet Chinese soups at home, so that’s probably why I don’t make them too often. But after our last trip to California, I decided it was time for me to try making something with taro root, because I really like it and Grandma tells me it’s good for you. One of the reasons I like taro root is because it is purple. Except in this case, it isn’t purple. I bought these at my local Whole Foods and when I cut into them I was disappointed to see the white flesh. My mom said the white ones are fine, but she agreed that the purple taro is prettier. 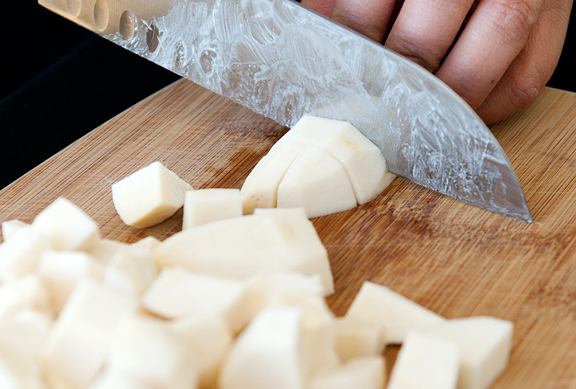 When you peel the taro root, there is a slimy, milky goo that gets on your hands and knife. I sent one flying across the kitchen as I tried to get a better grip to peel it. 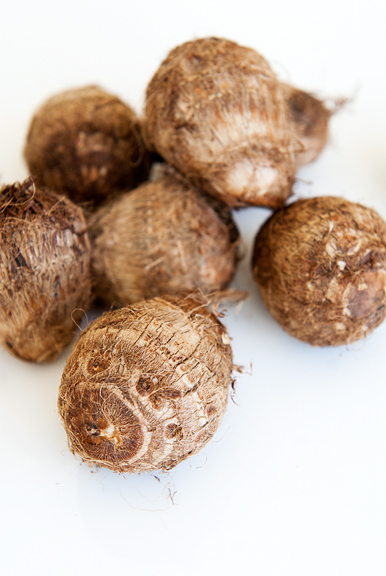 It’s not recommended that you eat raw taro root because it’s toxic. However, it is safe to eat when it’s cooked. 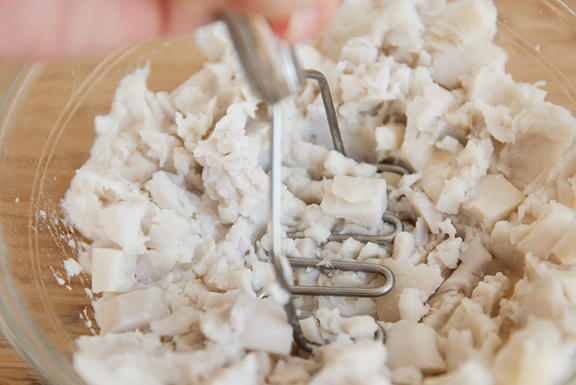 When I mashed the taro root, I left some chunks because I like biting into occasional pieces of the soft, starchy flesh. 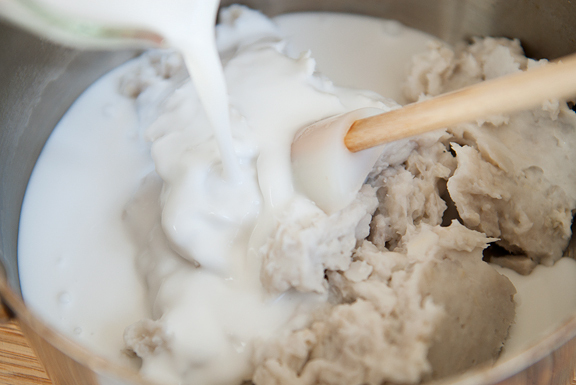 Mix the coconut milk in gradually, because the taro root mash is pretty thick. When the coconut milk is incorporated and the soup becomes more of a slurry, stir in the tapioca. 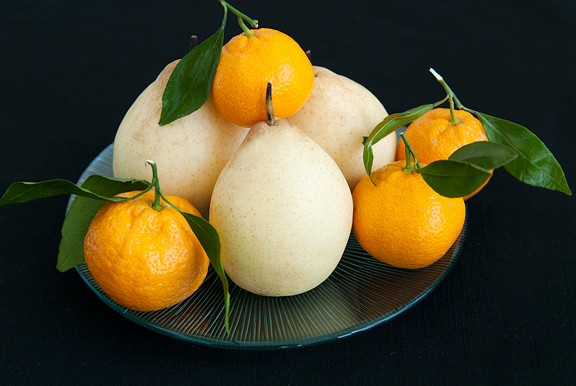 Chinese desserts don’t tend to be especially sweet in general, but you can adjust the amount of sugar to your liking. I really like this soup despite the disappointing absence of the purple taro root variety. It has a naturally thick consistency due to the starch of the taro root and the tapioca. The flavors are subtle and light. If you refrigerate the soup, it becomes almost pudding-like, but it resumes its soupy nature once reheated. Whether it’s taro root soup or cookies or sweet rice cakes, just make sure you eat something sweet first thing in the morning on Lunar New Year. It ensures that sweet things come out of your mouth all year. In a medium saucepan, bring four cups of water to a boil. 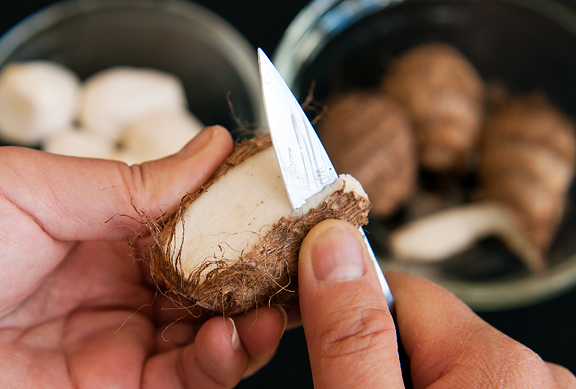 Add the taro root and cook until tender – about 20 minutes for fresh taro root. If you use frozen taro root then boil for about 5 or so minutes. Drain the taro root and mash it. Leave some chunks if you like. Boil another 2 cups of water in a saucepan (use same if you like). 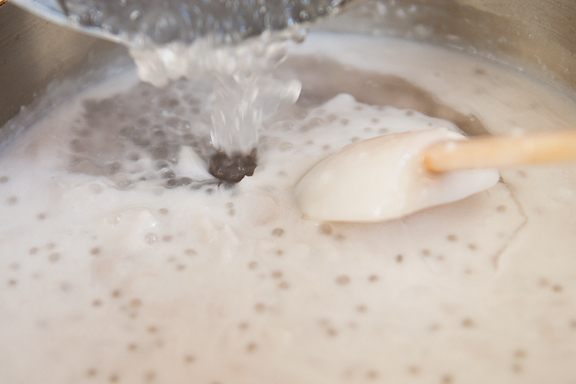 Add the tapioca to the water and boil for 5-6 minutes. Turn off the heat and cover the pan. Let it sit for 10-15 minutes. 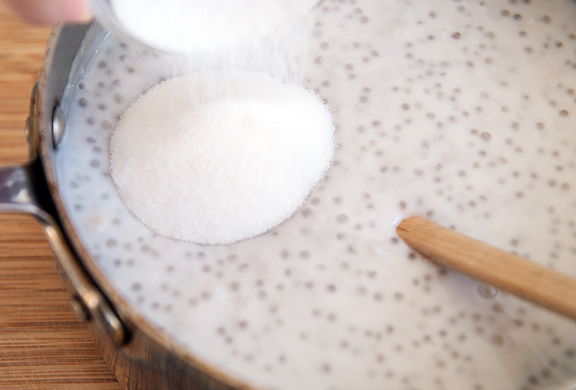 The tapioca is done when the pearls are translucent and you can no longer see the white center. Add the coconut milk to the taro root and stir until blended. 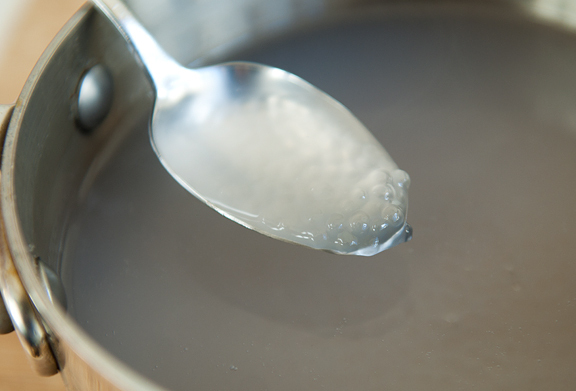 Stir in the tapioca and sugar over medium heat until the sugar is dissolved. Serve warm. Serves 6. It seem you have wonderful and delicious time :) I would like to try something with tapioca one day..
What a feast! That video is mad cool!! Dang, it’s cold. Happy new year! Happy New Year to you and yours Jen! Our momma beagle is about the same age as kaweah, and no they don’t get smarter. She will also cook her brains in the sun (she’s a mostly black beagle, so she really cooks) until she gets way overheated in the Florida sun. They never do learn, but we love them all the same! We tried the boiling water off the deck trick last weekend. It works pretty well with sub-zero temps! Fun shots of the droplets. Happy CHinese New Year! Thank you for the great posts. I loved the photos of the boiling water. Happy New Year! Wishing you health, luck, happiness and prosperity for the new year! Wonderful photos, and as it is now light in Kansas City, yes, science works at -2, the neighbor who saw me throwing a pan of ?? ?steam from my front door already thinks I’m not quite right. Happy New Year to you Jeremy, and Kaweah!! I love the shots you created. Have a fabulous Rabbit year, my dear. Happy New Year! 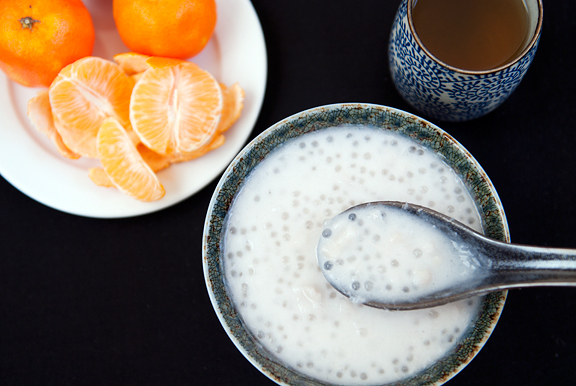 The Tapioca soup looks amazing…..gorgeous photos, as always.! Happy New Year Jen, Jeremy, and Kaweah! All the best for you, Jeremy and Kaweah! This looks amazing, I LOVE all the Chinese dessert soup things… the refreshing cool ones in summer are also so good. Always full of jelly, tapioca, and little beans. When I first had them at age 17 with my Chinese boyfriend I was off-put at first but they grew on me very fast. Almond jello is one of my favorites, especially with mandarin oranges. The soup looks equally delicious. I love this. : ) Happy Chinese New Year to you! i love taro! i love tapioca! i love soup! i like putting taro in xi fan, too. adds a nice sweetness to the dish. and the color is so pretty. happy new year! I love taro but never know how to pick them @ the market. Do you have a tip how to select them? Happy new year Jen! May this new year bring you health, happiness & peace! Jen, you are the only reason I have any kind of “Chinese cooking mojo” despite being full blooded Taiwanese-American. Thank you for these amazing recipes! Gong Xi Fa Cai to you too! =O Jen, i would be hard-pressed to name my favorite post of yours– because i love them all and they always entertain. truly. but i felt compelled to leave a comment, which i don’t often like to do, because this one just shot up close to the top, for more than one reason: 1) i LOVED that video, and your subsequent shots of the “experiment”. because i am a giant dork and i thought it was SO COOL. no pun intended. 2) i am a dog trainer and love any mention of Miss Kaweah 3) i am one of those who is never excited by Chinese desserts (lame Chinese daughter, i know), but i LOVE this soup. i’ve had it rarely, as it seems that it is less common in NJ (my cousin in San Fran says it’s common there), and i hate taro (i know, weird. lame Chinese daughter, again), but i just eat around the chunks of taro. for years, i have been trying to think of a way to replicate it at home but never dared to try. 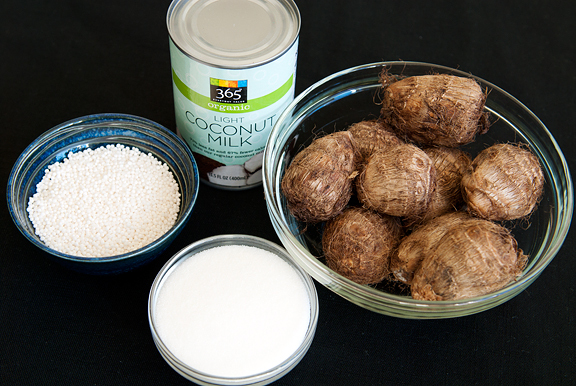 and i never knew there was a version of just “tapioca coconut soup” but now i do and i am determined to find a way to make it and have it for cold winter nights! seriously, you have been my hero lately– always with the amazing photos, and posting some of my favorite things (tom kah kai, bubble tea, salt and pepper pork, etc) that i’ve always been too shy/inexperienced to try myself. maybe next year i’ll have a Chinese dessert that i can enjoy too– since hung do grosses me out (my family had hung do nian gao tonight)…. wow, i am realizing just how much of a lame Chinese daughter i am with all the things i don’t eat…. anyway, THANK YOU!!! xin nien kuai le! ps. my mom saw the picture of your small, white taros and she said those ones are good if you boil them whole until they’re soft, peel them back a bit (like a banana), and dip them in sugar. she has a sweet tooth, i most decidedly do not so that just makes me gag, but that’s another option for you if any friends or family want to try it that way! Looks wonderful even if it’s not purple. I can’t wait to try this out. Taro is one of my favorite flavors and I love sweet soups for desserts. Happy Chinese New Year! What a wonderful combination…I’ve never tried this before, but try it I must! Taro reminds me of my time spent in Palau! I loved it so much and only recently, I found out that there is at least one store in Berlin where you can buy Taro! That made me sooo happy, because eating it brings back all the good memories I had in Palau! Gung Hay Fat Choy, Jen! Love your anecdotes…love your pics…love your recipes…love, love, love taro! Universe did me a great favor tonight. I was searching for Chinese restaurants in Italy (for my cousin who is currently stationed there) and my relentless mouse clicking fingers somehow found your blog. No lie! 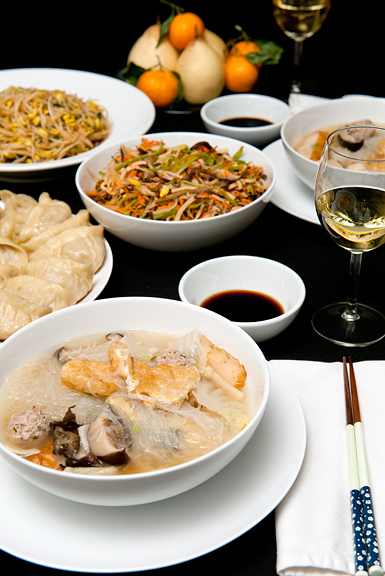 My cousin’s complaining about no decent Chinese food in Italy, brought me to your space on the Web. I thought I’d just read a couple of posts…but now my rear is paralyzed…I’ve been sitting at my computer skimming through your archives, nonstop!!! I hear ya…reassessing why you have this plot of virtual land..is important! Thank you for sharing your goodness with so many people! Happy Chinese New Year, Jen! Thanks for sharing this recipe – it’s one of my favorites! I haven’t had that for years. It is great you used taro root. I have to see if I could find some. Thanks for posting this recipe! I would love to make it but I just want to make sure that I need to drain the cooking water from the tapioca before adding the tapioca into the mixture? Thanks so much! Thanks and happy new year to all of you! xo I didn’t think this would be a particularly popular recipe, but apparently there are lots of folks out there who love it as much as I do. Yay! Allison – I’m so glad you’ve seen the light! :) I saw your photo of new year’s goodies on FB. Mmmmm!! I’d love to have Son’s parents cook for me ANYDAY. Paulette – our pup’s paws are big, but her ankles are skinny, so the booties don’t fit well on her (although I want to “adjust” them some day). Lisa – happy new year, Mom! Eve – Hrm, I think I went for ones without a lot of scars or cuts. Firm (not squishy) and just generally looked “healthy”. Other than that, I really don’t know. farmerpam – thanks, what a lovely image. Tina – thank you for the tip! Caroline – well, you COULD drain the water, but I didn’t because I felt my soup wasn’t “soupy” enough and because I like the thickened tapioca water. Just do what you prefer. contessa washington – I have no idea what that is? If it’s dried tapioca in a jar, sure. If it’s cooked… I guess don’t cook it and just add it? I just found out about your blog. love it! recipes are easy to make :) Thanks!! Thank you so much for this tutorial! I was craving this after having it at a local restaurant, I didn’t realize how easy it is to make! Do you know the calorie count on a 8 oz bowl?